Hello everyone, this is Ben calling in here on Kilimanjaro with Team Lean and Mean; we are Team 6. We’re doing well. We’re at Barranco Camp, we’re just waking up at Barranco Camp actually. Sorry I didn’t get a call in yesterday afternoon. It was a bit of a longish day here, but we did very well. It took us about eight hours to get here to Barranco Camp yesterday from Shira Camp. And we had some weather along the way. We had some rain, we had some hail, and we even had some snow as we got up near Lava Tower (at 15,300 feet). And that was our high point for the day at 15,200 feet and everybody did great up there, felt good for the most part, acclimatizing very well. And then we dropped down from there, down to Barranco Camp here, which is at just under 13,000 feet (about 12,900 feet, 12,910 feet or so). People did very well yesterday and are feeling good. Today’s our shortest day. 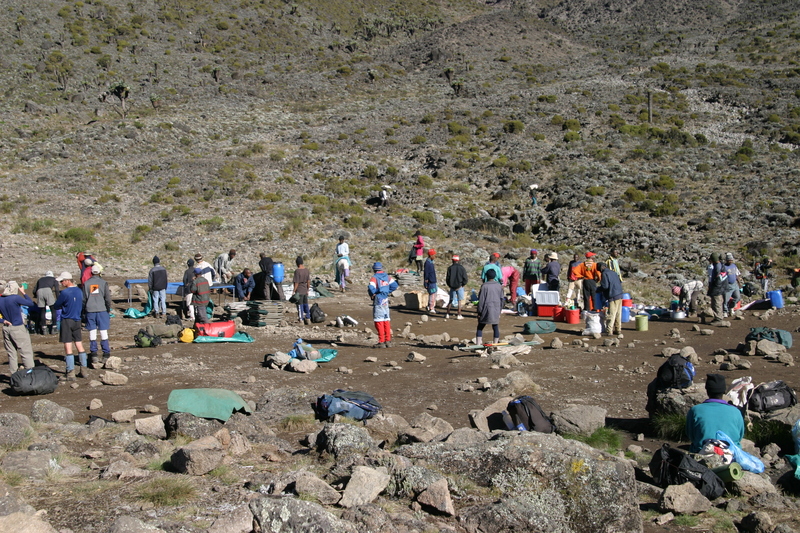 We’re going to move up the Barranco Wall here and continue on to Karanga Camp. It’s only about four hours. And Karanga Camp is at about 14,400 feet or so, so we’ll spend the night there and head up to our High Camp the following day and get ready to summit. So we’re doing well. It’s going quick here but people are doing excellent with the altitude and we’ll see how people are doing up and on the mountain today. Looks like it will be a nice day today hopefully. It’s been pretty clear in the mornings and then in the afternoons we’ve gotten rain every day so far. So hopefully that will start to change here in the next few days. Everybody says “hello” to everyone following along back home and we’ll talk to you tomorrow. Terry recounts his technical summit, as the team readies for their second challenge: Cotopaxi (19,347ft/5,897m). Terry reporting from Cotopaxi at an altitude of 17,700 ft.